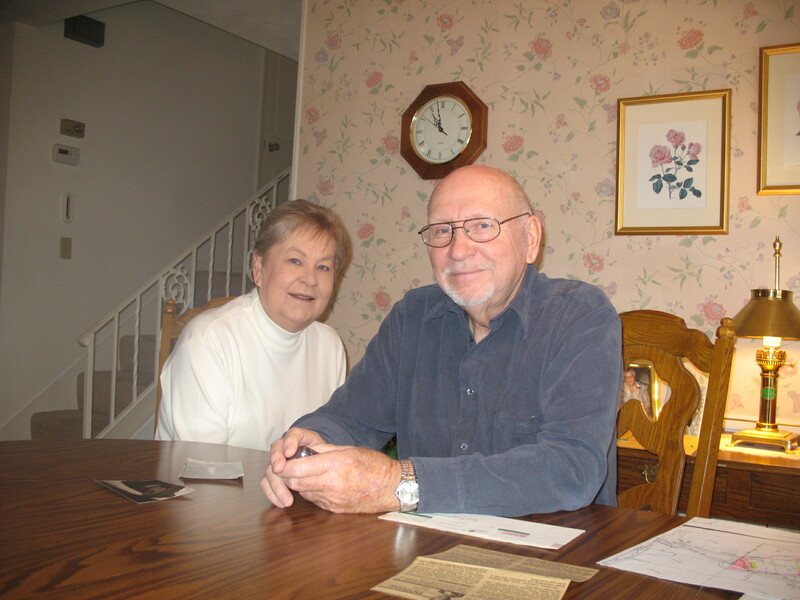 Married a half century, Mary and Jim Connaughton have fond memories of Rocky Glen. “It was beautiful,” Mary said, recalling blackberry picking expeditions and the waterfalls, which still flow today. Jim remembered the hayfields on top of Rocky Glen, and the herd of horses his dad kept in the pastures there. His mother fed them every day, he said. Jim Connaughton’s dad Harold Connaughton bought the Rocky Glen property, now about 97 acres, in 1954 from George Vickery. Vickery’s family had owned Rocky Glen since the 19th century. The Connaughtons never lived on the property, but farmed it. The peaceful rural scene from the 1950s, hidden along Kickapoo Creek Road in West Peoria, was a far cry from the events of the 19th century. Then, coal miners bravely used Rocky Glen as a meeting place to organize a union and a strike, a daring event. That story is told in the book Horse Shoe Bottoms, a novel written in 1935 by Tom Tippett, an author, labor journalist and activist, miner, educator and government employee in the New Deal programs of the Roosevelt administration. The novel is a fictionalized account of the life of Tippett’s father, a miner who organized his fellow miners in meetings at Rocky Glen, according to Bill Knight, who reissued Horse Shoe Bottoms in 2008. Knight’s introduction to the 2008 reissued novel details the life and times of Tippett, his place in literary history as a writer, and background on the struggle of miners as it has continued into the present time. Tippett died in 1979. Today, the rocks of Rocky Glen still bear the historic carvings of these early miners and the logo of the United Mine Workers, century-old petroglyphs of a vanished era. The Peoria Park District own an adjacent property, and may have thought it was buying the Rocky Glen site, Jim Connaughton said. But a survey showed the canyon leading back to the waterfall, and the waterfall itself, remained separate from the park district’s land. Jim Connaughton now owns the property jointly with his sister-in-law, Patricia. Her husband, Jim Connaughton’s brother, died a few years ago. Rocky Glen is posted for no trespassing or hunting. But Connaughton has led several group hikes through the canyon back to the falls, and the hikes will continue as interest grows in purchasing the property and preserving it. It is good to hear from you! We love to hear stories relating to the history of Rocky Glen. An entrance to one of the coal mines still exists along our hike. It is about 4 to 5′ high and goes back about 30′ before it is closed up. We would love to hear any stories that you may have and would love to see photos if you have any. My mother who is in her eighties was telling me about life during WW2, and she remembers that areas in Rocky Glen were designated as victory gardens. Each family was given a plot to work the land. She and her parents used to load their tools up in the car each night after dinner to go work in the garden. That’s a cool story! Is there any chance she might remember where the victory gardens are? We are doing our best to preserve as much of the history of Rocky Glen that we can including geology, botany, and the social history. Possibly. She and I have been talking about taking one of the monthly walks. I think she is concerned about the distance, so we are waiting for a cooler day. Makes sense. Our August hike has been canceled, but September may be a better time for weather. Personally, the fall hikes are my favorite time of year. If you think of it before you come out, would you mind letting me know? If I’m not the hike leader that month, I can make sure the other leaders know she is there. Todd 309-253-2242. Thanks again for reaching out!